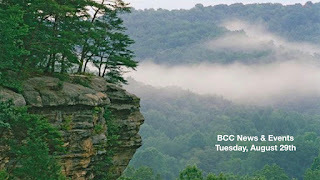 Participate every Wednesday at BCC's Care Network. Enjoy dinner by donation this Wednesday from Lola's at 6:00 PM and at 6:30 PM we will serve the emotional, spiritual, and physical needs of those who find themselves in difficult situations. BCC is growing and that is certainly a great reason to celebrate. We have seen multiple lives changed this summer. People are moving into a more dynamic relationship with Jesus Christ. Join us this Sunday, September 3rd for a combined service on the lawn at 10:30 A.M. Pastor Mark will continue the Best Day Ever Series and will ask the question "What should a Christ follower's work day look like?" This service will be followed with lunch on the grounds. You can bring your lunch or order from the food trucks. We will then enjoy various games and activities such as corn hole, flag football, frisbee golf, family Brevard bike path ride and open play. So bring your friends and let's celebrate, eat, and play as a big family. Early weekend service will be held outside on Thursday, August 31st. Don't forget to bring a lawn chair. If it rains, we will simply move the celebration inside! Take your Bible Study to the next level! Join us September 10th-December 3rd for an in depth study through the books of Matthew, Mark, Luke, John, and Acts and let the Word of God teach you and transform you. The Gospel Project Study parallels with what the children are learning in KidzZone. This can open the way for great family discussions. This study meets during first service from 9 AM to 10 AM in the brown house. For more information, please contact Trudy Pierron at gtpierron@citcom.net or visit www.gospelproject.com. The Augustine Literacy Project needs new volunteers to continue providing free, trained, reading tutors for students struggling with literacy skills. The dates for the training are the weeks of September 4th and 11th. For more information, please contact Wendi Adair at brevardaugustine@gmail.com or visit www.augustineproject-brevard.org. "Tutor one child. Change two lives." In observance of Labor Day, the church office will be closed next Monday, September 4th and Tuesday, September 5th.